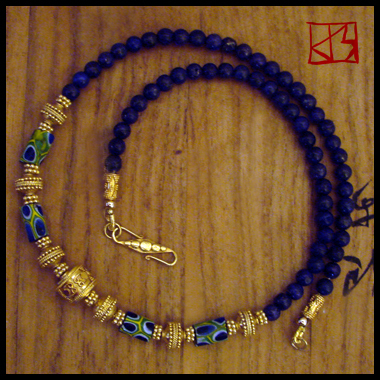 Beads have been the source of trade for millennia before the first coins were cast, their value based on material, size, beauty and rarity. 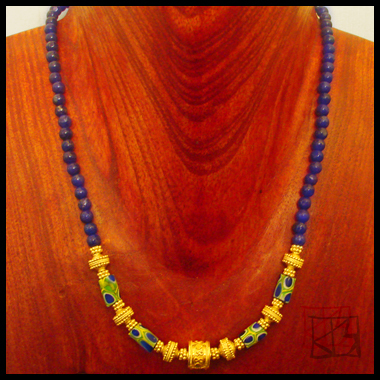 When Europeans traversed Africa they discovered it was their adornments -- not their money -- the locals wanted in trade for their goods. And to ease the passage for slavers, truth be told. Since the 1500s, Venetians were and are still prolific masters of glassmaking and the source of some of the most precious trade beads coveted by collectors. 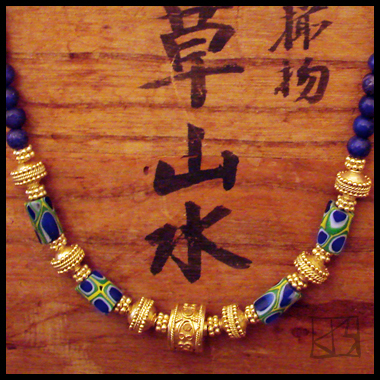 The pattern of the antique beads used in this piece is specifically called 'Snake Spot' (general called 'Mosaic'), and these specimens have an unusually clear four-color design: royal blue, bright green and yellow, and a touch of white. 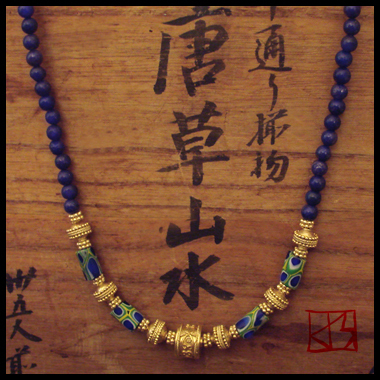 To honor their history and antiquity, the design elevates these rare beads, surrounding them with 22kt gold vermeil beads crafted in Bali and high quality natural blue lapis lazuli beads from Afghanistan -- combined in the delicate style of India making for a truly trans-global treasury. 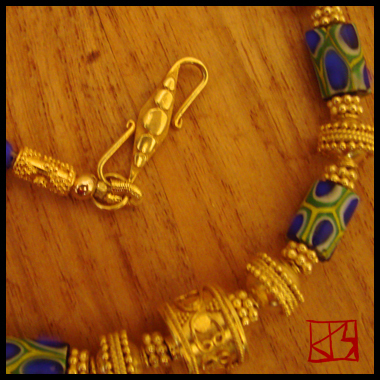 Finished with a 22kt gold vermeil S-hook clasp, also made Bali.